Applying to university is a big step for any College student. Just as you start to settle in to life in further education, the next big topic on the agenda is what are your options after College. Before you know it, you’ve signed up to UCAS and are full steam ahead with university research! Student, Nathan Clark, previously of Cams Hill School in Fareham, joined Portsmouth College in 2016 wanting to pursue a career in Science. Early on in Nathan’s first year at College, his teacher identified him as having the potential to pursue a degree at an Oxbridge university, which spurred him on to push himself further. He gained support from our Focus team who identified that Nathan had a slow processing need, however, they found a strategy to help him succeed in his studies nonetheless. He took the time to look round many universities to consider the right course and university for him at the end of his first year and early into his second year at College. 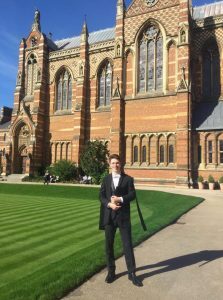 He fell in love with the prestigious Keble College (Oxford), and with support and guidance from our Careers team with his personal statement, he applied for Keble College (Oxford), Sussex, Surrey and Warwick and secured offers with all universities. Nathan had to sit a written test for his Oxford application and then had to go through an interview process which is often known to last up to three days! For Nathan, he had to endure two interviews with the tutors from Keble College. With an offer received to read Chemistry at Oxford, this gave Nathan huge motivation to keep focused and work hard to secure the grades necessary. He achieved this through ensuring he planned his revision to give him the necessary time to cover the specifications in full, and to have lots of time to practice exam questions. Results day finally arrived and Nathan was delighted to find he had achieved A*, A* and A which confirmed his offer at Oxford. “Portsmouth College has given me a great experience and their innovative timetable and use of iPads have helped me get where I am now”. He is now at the University of Oxford and has recently completed his matriculation where he became an official student! We wish him every success with his future.